« Easy Exercise Program for New Moms to Do WITH Their Baby to Lose That Baby Weight! If the nickname Ringo wasn't already taken by the ever-so-popular Beatle, Ringo Starr, I swear that it could have been mine. I LOVE wearing rings and the more interesting and unique they are, the better. Chic Monkey Boutique instantly caught my attention with their large variety of sterling silver monogrammed jewelry, including the square sterling silver ring I was sent to review. What's great about this online boutique is that not only do they carry a whole host of top-notch jewelry, they carry a ton of upscale pieces for your children and your home, all at reasonable prices. Keep reading to see the square monogrammed ring for yourself and to learn more about the Chic Monkey Boutique! 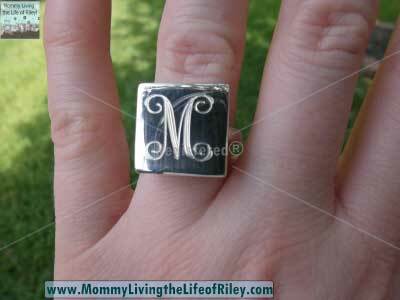 I reviewed the Monogrammed Sterling Silver Square Ringfrom Chic Monkey Boutique, which retails for $76.00. The Monogrammed Sterling Silver Square Ring from Chic Monkey Boutique is a simple, yet elegant ring which catches the light and your attention like no other. I love the smooth, flat 1/2" square face of this ring, which is an extremely large surface for the light to dance off of. Every time I wear this ring, I always seem to get a ton of compliments on it. It is also an extremely well-made piece with a very thick and durable sterling silver band attached to the personalized square plate. This is an especially important feature for me, since I seem to be so very hard on my rings and need a thicker, more hardy piece of jewelry to take the abuse that I dish out. There's no doubt in my mind that the Monogrammed Sterling Silver Square Ring is more than capable of withstanding...me! If you love monogrammed jewelry as much as I do, then I highly recommend shopping the selection available from the Chic Monkey Boutique. 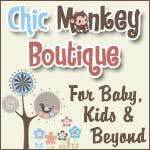 Thanks to the Chic Monkey Boutique, both your home and your family can be dressed to the nines without breaking the bank! 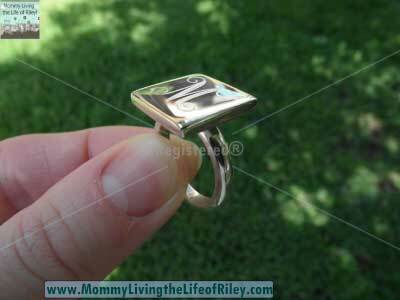 Disclosure: I received the Monogrammed Sterling Silver Square Ring from Chic Monkey Boutique in order to facilitate my review. No other compensation was received. This product review is based on my own personal experiences with this item and is completely honest and objective.